At the risk of sounding like all those text messages you were spammed with for the last three days, Happy New Year, everyone! Now I’m not usually a resolutions kind of person, but I have 3 resolutions for 2011, which I should hopefully be able to stick to, so here goes. To be honest, I haven’t been writing as much as I should have. Maybe it’s because I think before I write anything now (which is a complete rarity by itself, I never think before I do anything. I usually do something and then think about why I ended up there which usually results in me concluding that I should think before I do something. It’s complicated) and blogging has gone from being enjoyable to something like writing an exam. So this year, I’m going to forget it all and go back to writing like I used to, writing like I want to. You have been warned. My CA final exam is up this May. Meet my syllabus. I lost a lot of weight the last year. When people ask me how, I giggle and say the stress of doing CA got to me. It didn’t. (Warning! This is going to get mildly serious-boring-depressing.) The past year (and a bit of 2009) I had a bonafide eating disorder. It started out as depression induced (because I had been a pseudo-flunkie), and then it started giving everyone around me depression. I still don’t feel too comfortable to give complete details about what happened, because it’s something that I’m really not proud of. The amount of control the disorder has over you, is scary – to the point where you associate everything that’s important with being thin. After what has been a difficult year, I want to reclaim my appetite, and I want to eat without feeling remorse after every meal. Being thin doesn’t make you happy. Nutella does. 'blogging has gone from being enjoyable to something like writing an exam' Rightly said! 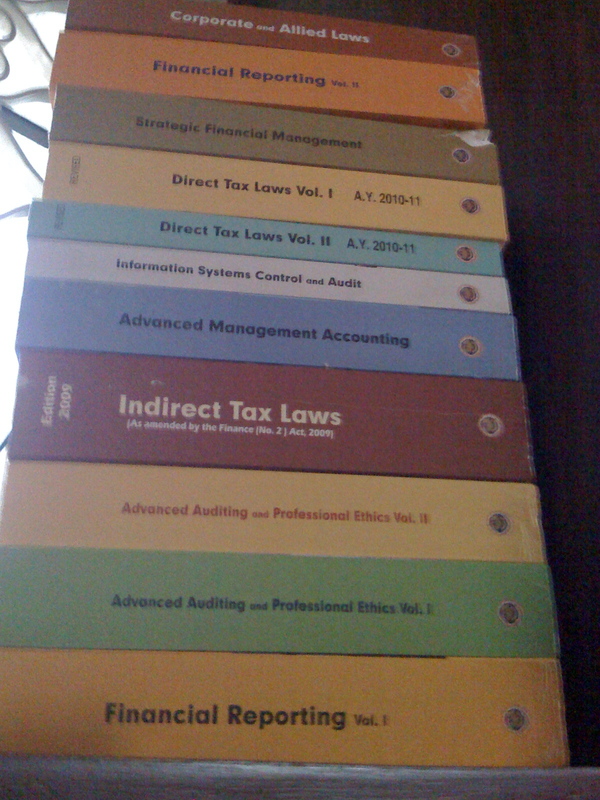 Looking forward to more blogs in 2011 and best wishes for the CA final exam. Sigh, and my resolution is to LOSE weight. Let's hope we both get there. yea, going the whole way! CA Finala ivallava ippo? Kanna kattuthey!! All the best for your Finals (both groups)!!! I am really upset that you folks either stop writing (like inbavalli) or make it private (a la, idling in top gear)! Then what we would do in Office? No more excuses accepted!! You should start w.i.e!! Chutney! Follow your heart's dictat. Do what you love to do. CA Final is no big deal, if you just be uptodate and regular in your studies (Yeah! I heard you, it is tough ofcourse) but few can write as well as you do. Happy new year. all the best for ur CA exams as well. Sometimes being yourself is the hardest thing to do 🙂 But only that will make your blog more fun. Not taking it more seriously thinking you are being responsible and respecting your hundreds of fans. That will only bring pressure, which kills a lot of creativity. I remember the days when you were nominated for humorous blog and you compared yourself to Kenya in World cup cricket 🙂 That was a moment I chuckled a lot. Its like how most really talented guys screw up with some nice chick, due to pressure 🙂 Chill out.. Don't take your exams seriously.. they are just tests. Not absolute measure of success. aiyayo!!!!! just saw idling in top gear has made things private!!! waaaaaaaaaaaaaaaa!!!! :'( someone pls recommend me to top gear, am harmless!!!! Good luck with everything. And most importantly – having an eating disorder is NOTHING TO BE ASHAMED OF. It is an illness, and it has to be treated. Recognizing that you have a problem is a big part of the battle won. My best wishes to you for this and everything else you undertake. Keeping Resolutions are not so bad afterall. I recently started following your blog . I can relate very much when you say blogging has become an exam . I wish you a great blogging(writing) year and here is a quote of Maugham that you am sure will be able to relate to. "The artist produces for the liberation of his soul. It is his nature to create as it is the nature of water to run down the hill." Its sad to see you talk about blogging with the pressure usually associated with exams. The best exams we took are the ones that sailed super smooth – with the prep and after the exam, you know you have nailed it. That can be a little hard with CA (if my dad were to be believed). It might be better to concentrate on your exams, and blog when/if you find free time. Though your syllabus is so vast, you still had time to make this blog entry. I'm sure you are an expert when it comes to time-management. My best wishes for the new year and your CA exams! LOL!! Although I have hardly ever seen people fulfilling New Year resolutions, I sincerely hope u fulfill yours. All the best in studying that insane syllabus(insane even for an engineering student like me) and completing your CA. Be careful about the last resolution though. It might turn out to be an irreversible and unwanted process. Chutney! 🙂 Happy new year to you! I am not a resolution-keeper… never been able to keep mine. :) Bit, i sincerely hope yours works out great. And your year will be super! 🙂 No worries! Looks like CA Final syllabus has only gone north in the past few years. Used to be a bit less bulky back in 2004 days. Good luck with the exam!! Maybe I should borrow that one from you. I too have been having problem eating, for the past 10 years (?) It never bothered me as much as it did my relatives. But I hope your much more successful than me in tackling it. A very belated Happy New Year..!!! Mainland China makes you happy! Whattaplace! Any updates on resolution #1? Oh btw, Happy New Year. And yeah, best of luck with those books. If all else fails, you can eat them. You don't know me.. but I love your writing and I would love to know what you would say.. So, here goes… You have been tagged! Impressed by the number of comments on your page! Wish I had your success in blogging :). Very nice blog here. Best of luck with CA and happy blogging. I hope you do something like this. You can do it. Happy b'day and Happy Women's day!!!! You seem to have not stuck to the first resolution. Shame, because I enjoy reading your blog. I hope the second and third are working out well for you. Three months in, it's been a pretty good year for me. I hope it has been the same, if not better for you as well.